Tele-workshops | Alzheimer Society of B.C. 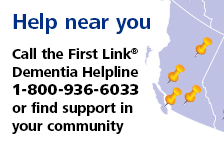 Learn from home — participate in the Alzheimer Society of B.C.’s free one-hour tele-workshops. It’s easy to participate. You can just listen on the phone or you can watch a live presentation on your computer, with sound provided by your computer (allowing for worldwide free access!) or by your phone. You also have the option of downloading handouts after the session. Take a survey to help us make our tele-workshops better! Visit the Tele-workshop web login page. Tuesday, May 14, 2 p.m. or 7 p.m.
We all have a role to play in making our community dementia friendly. Learn about dementia and how you can help people living with dementia feel included and supported. Wednesday, June 12, 2 p.m. This facilitated discussion will discuss the challenges and safety concerns that may present when travelling with a person who is living with dementia. Learn strategies to help your trip go more smoothly. Subscribe to receive notifications of upcoming webinars.